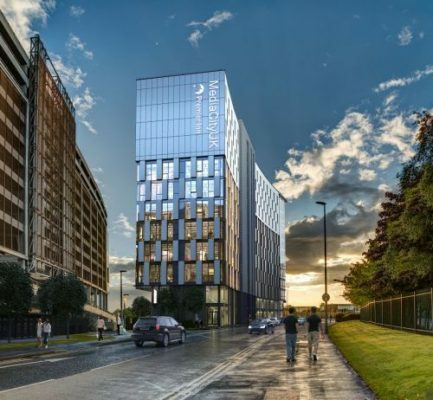 It also includes a separate studio complex, hotel, speculative office buildings, new media department for the University of Salford, a site-wide energy centre, retail and catering facilities and a multi-storey car park. These elements are all set within a high quality public realm that incorporates a large media piazza, Metrolink terminus and a park. Sitting above two of the BBC buildings are towers that provide 378 apartments designed by Chapman Taylor. These range from studio flats to three bedroom duplex penthouses. 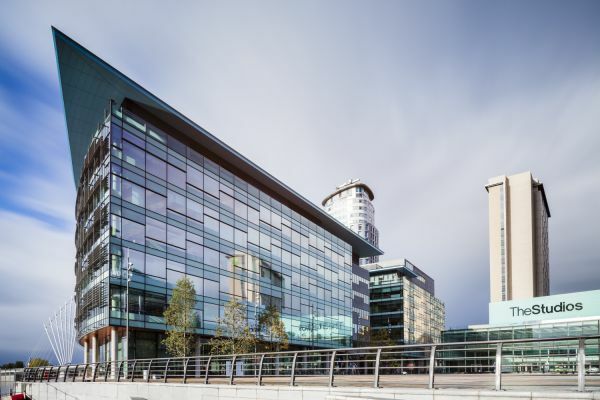 The detailed design specifies high quality design and fittings creating upmarket, contemporary accommodation, in the heart of this innovative hub to rival many media cities emerging around the world. Surrounded by water, MediaCityUK has not only completely transformed the Salford Quays landscape and skyline, but became the first development in the world to obtain BREEAM Sustainable Community status, incorporating world leading sustainability into the design of the £500m development. 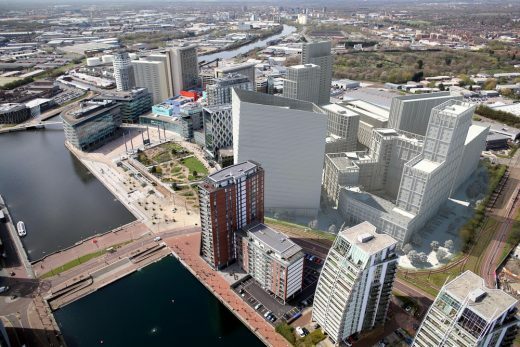 MediaCityUK is set to double in size over the next decade under ambitious plans with ten new buildings envisaged with a development value of more than £1 billion. 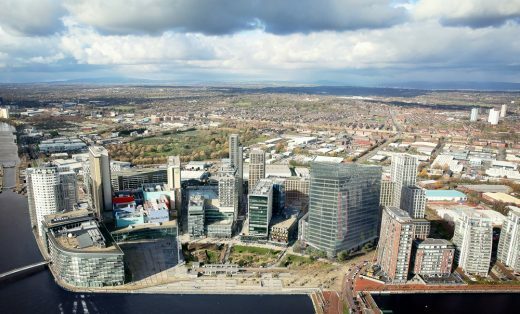 Key features of phase two, masterplanned by Chapman Taylor along with six architectural practices has been submitted for planning to Salford City Council. The scheme includes innovative public spaces, offices, shops and residential courts with a pedestrian promenade running through the scheme. 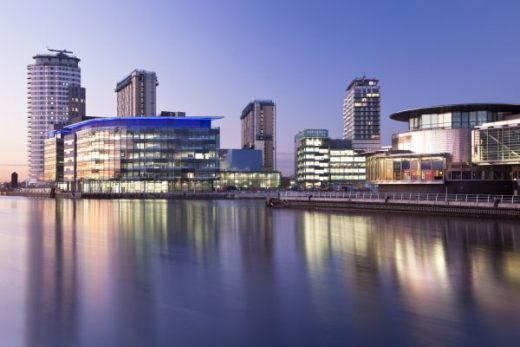 MediaCityUK is a joint venture between Peel Land and Property and Legal and General Capital, who share a long-term commitment to the further expansion of a creative and digital hub which already houses 250 businesses including the BBC, ITV, dock10, Ericsson and SIS. 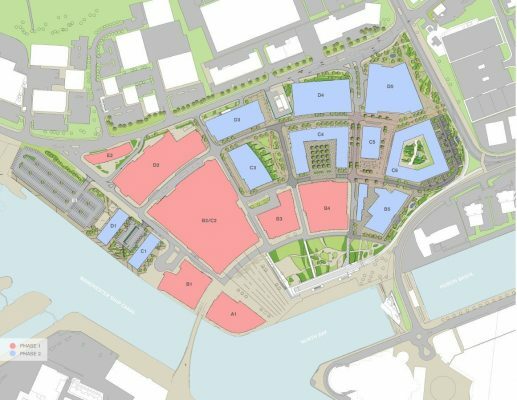 • Chapman Taylor – master plan guardian and co-ordinator, designers for plots C3 / offices, C6 / residential & retail and D4 / parking, live-work apartments, studio offices, bike hub, site-wide plant.